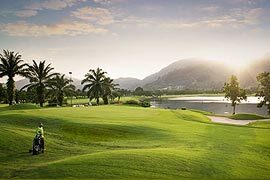 The par 5, 5th hole is the longest hole on the course and one of the longest holes in Thailand. The most likely landing area for tee shots has a cluster of bunkers to its right and a lake on the left. More water off to the left down the fairway provides further distraction. This hole requires three perfect shots to reach green, 604 야드 away from the back tee.